Sea Stories: Are Sharks Primitive? Primitive? I don't think so! Since sharks are an ancient group of animals, people often assume that they are primitive in some way, but this assumption couldn't be further from the truth. With such a long evolutionary history, sharks have had plenty of time to refine themselves. Recent studies have shown sharks to be remarkably sophisticated. For example, most sharks have an incredible sense of smell. Extrapolations of experiments on shark smell have suggested that some sharks can detect one drop of blood dissolved in as much as one million gallons of water. Such a keenly developed sense of smell leaves no doubt that a shark has few rivals in the nose department. Sharks also have senses we can't even begin to experience. Sharks have an electrosensory system that allows them to detect the extremely minute bio-electrical currents generated, for example, by the muscles of a swimming fish. The snout of a shark is covered in tiny pores called Ampullae of Lorenzini, filled with a jelly-like substance leading to nerve cells. The Ampullae of Lorenzini convert electrical impulses in the water to an electrical signal in the shark's nerves. Therefore the shark can “feel” extremely tiny electrical currents in the water. To put the sensitivity of this electrosensory system in perspective, imagine connecting wires to a nine volt transistor radio battery and separating the ends of the wires by a kilometer. Some sharks can detect that electrical current. At close range, a fish hiding in a hole is betrayed by the electrical signature of its own heart beating. Some sharks can “hear” the tiny pressure variations generated by an injured fish struggling to swim. They don't do this with the kind of hearing we humans have (eardrums), but with a system common to many fish called a lateral line. Along the sides of a shark, a series of pores contain small capsules, each containing a tiny hair-like fiber. Very small changes in water pressure cause the fibers to move, sending a signal to the shark. The shark learns to recognize the “feel” of different kinds of pressure variations, such as those caused by a struggling injured fish off in the distance, too far away to see. The shark then knows possible food is nearby and begins to search for the fish. Many people mistakenly believe that sharks have poor eyesight. 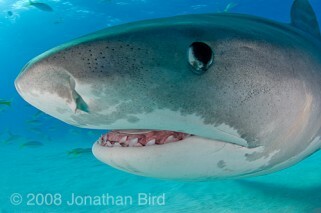 Most sharks in fact have excellent eyesight, and many have simply incredible low light vision. A shiny mirror-like layer located behind the retina called the tapetum lucidum reflects light back through the retina a second time, increasing its sensitivity. At night, the eyes of these sharks reflect light the same way the eyes of cats do because cats and sharks share similar low-light adaptations of eyesight. Many sharks like to hunt at dawn and dusk, because they can see their prey much better than the prey can see them. Sharks never need to go to a dentist, since they don't really care about cavities. They have many rows of teeth. The first row of teeth is used until they get dull or break. Then they fall out and new ones rotate into place from the next row back as if the teeth are on a conveyer belt. For the entire life of a shark, it never runs out of new teeth, and never worries about the teeth it has. In addition to teeth in its mouth, a shark also has a kind of “teeth” on its skin, called dermal denticles. These denticles, like the scales on a bony fish, all point to towards the tail. Water flows smoothly over them as the shark swims. A hand brushed from head to tail over the skin of the shark will detect a reasonably smooth surface. But brush a hand backwards from tail to the head and the skin feels very rough, like sandpaper. The dermal denticles make the skin of a shark incredibly tough. Sharks smell better than us, hear better than us, see better than us in low light, recognize electrical signals to which we are completely blind and have perfect teeth. These are certainly not the attributes of a primitive animal. It's no coincidence that they are top predators in the ocean. So sharks have been in the oceans of the world for over 350 million years. They have been here a lot longer than humans. But are they primitive? Not at all!